This 1950’s sock hop is a doo wop disaster! 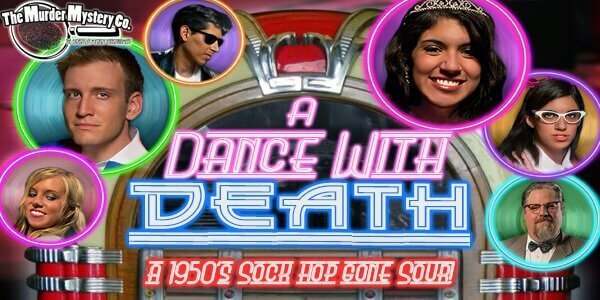 When a death on the dance floor makes this fun night a party foul, it is up to you to figure out whodunit and get this dance back on track. Trade clues with your guests, gather information about the crime, and reveal the punk that made this hop go to nowheresville. This night of laughter and dancing is now too heavy to razz anyone’s berries, so it’s up to you to find the murderer! Word from the bird is this is one show you will not want to miss. This night is shootin' to be swell despite the disaster. This is a chance for the ladies to get all dolled up for dancing in poodle skirts, bobby socks, and a pony tail with a floppy hair bow. The guys will look perfect as Greasers with cuffed jeans, white t-shirts and leather jackets, or as Jocks, complete with a letterman jackets! Get ready to put on your thinking caps; you’ll need your wits about you to solve this crime.